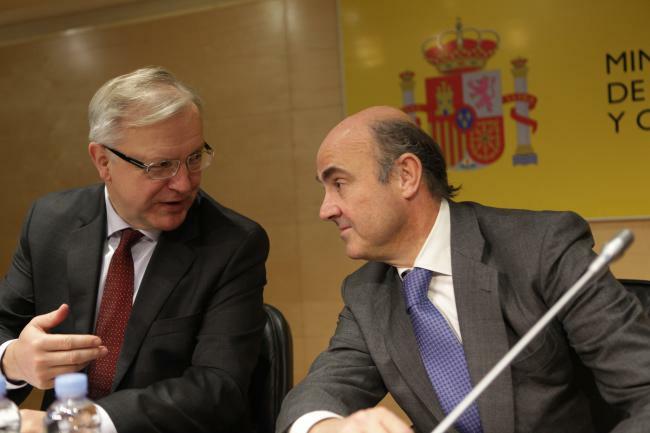 Olli Rehn, Vice President of the EC in charge of Economic and Monetary Affairs and the euro (on the left) meets Luis de Guindos Jurado, Spanish Minister for Economy and Competitiveness. (EC Audiovisual Services). European markets had a very bad day yesterday, Monday 4 February. During the first hour of business bourses all over Europe, the euro included, had a discouraging start. The largest losses were monitored in the Paris stock exchange, with the CAC index losing around 3%, a large percentage change for a prime market. In view of that the Sting observes today that, “investors will continue watching the public opinion pools in Italy as well as the way the (Spanish PM) Mariano Rajoy manages his personal problem (allegations about black political money)”. As a result Sting concluded that, “South Eurozone countries (are) threatened by rising borrowing cost and expensive euro”. The reason behind market itchiness has to be looked for in the latest political developments in Italy and Spain. Seemingly investors are alarmed with the fragility of the political scenery in those two countries. “The successful conclusion of the second review mission to Spain shows that the repair and reform of the Spanish financial sector is proceeding apace. Bank recapitalisation and restructuring is underway, and the asset management company SAREB (the bad bank) is up and running. In parallel, important decisions have been taken to reinforce the supervision and regulation of the sector. These are essential steps to creating the responsible and healthy financial sector Spain needs in order to ensure access to credit for households and businesses. This process must be completed on schedule and implemented rigorously”. Fortunately, the positive outcome of this review over Spanish banks was enough to restore confidence to south European values. All markets recorded early gains today Tuesday, the euro included. Still all those latest ups and downs in Europe’s financial universe reveal that the slightest disturbance can derail the political-economic equilibrium. This means nothing is over and both Italy and Spain have to continue pursuing rigorous policies. To this effect Rehn also commented that, “The fall in sovereign funding costs in recent months is a reflection of investors’ growing confidence in the measures taken in Spain and in the eurozone to address both the symptoms and the causes of the crisis. To build on this important progress and ensure that these benefits filter through into the real economy, it will be essential for Spain to maintain its focus on both sound public finances and determined implementation of economic reforms, in line with the EU’s Country-Specific Recommendations”. As a matter of fact uncertainties will continue haunting South Europe, until markets are convinced that the two heavyweights, Italy and Spain, have consolidated the servicing of their sovereign debt. And this is a herculean task that cannot be accomplished in weeks or months. The two countries need at least two or three years of sound financial and fiscal exercises, in order to secure a solid return to normality. « EU-China relations under investigation?